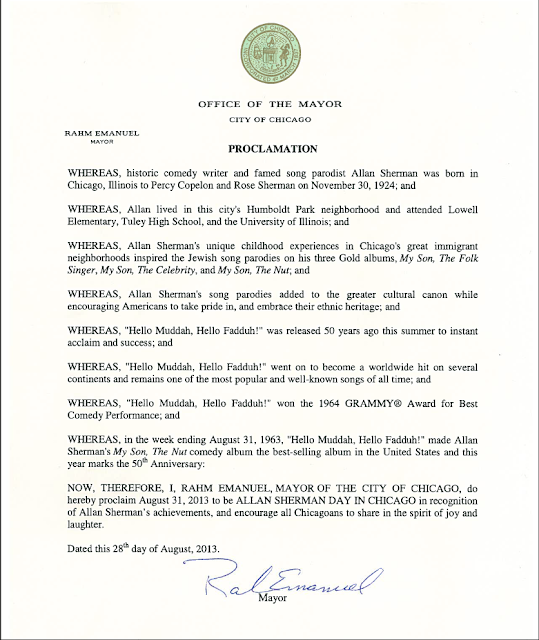 Chicago Mayor Rahm Emanuel's proclamation announcing Allan Sherman Day! Chicago Mayor Rahm Emanuel's proclamation announcing Allan Sherman Day in Chicago on August 31, 2013! The proclamation, to be released Wednesday, will recognize the 50th anniversary of the Chicago native's famous "Hello Muddah, Hello Fadduh!" 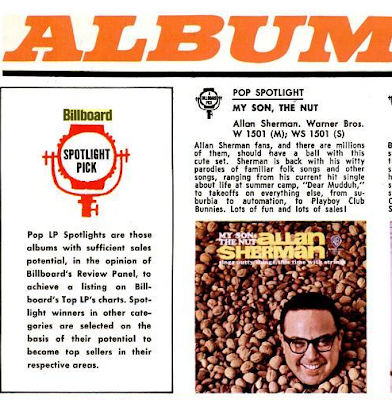 song, and also the 50th anniversary of Sherman's My Son, The Nut becoming the #1 bestselling album in the country. My Son, The Nut includes "Hello Muddah." 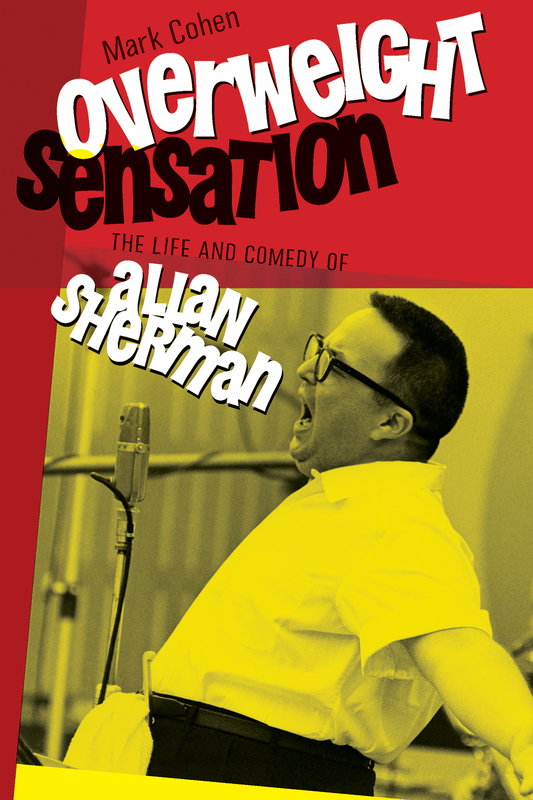 Allan Sherman was born in Chicago on November 30, 1924. He attended Lowell Elementary School and Tuley High. His childhood experiences living with his immigrant grandparents Leon and Esther Sherman at 3219 West Division Street led to the humorous Jewish song parodies that won him great fame in October 1962 with his first album, My Son, The Folk Singer. Folk Singer's radio hit was the "Sarah Jackman" parody of "Frere Jacques," and that song's popularity helped the Folk Singer album sell more than 1 million copies and become the #1 album in the country. The album went Gold, and was quickly followed in December 1962 by My Son, The Celebrity. It also went Gold. 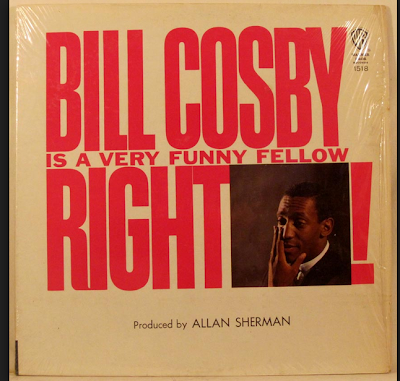 Memorable songs from Celebrity include "Won't You Come Home, Disraeli," a parody of "Won't You Come Home, Bill Bailey," and "Harvey and Sheila," Sherman's parody of the Jewish folk song "Hava Nagilah." Sherman's third album, My Son, The Nut, and "Hello Muddah, Hello Fadduh!" single were released in late July 1963. The song about the travails of boy at Camp Granada struck a cultural nerve that resulted in buyers "actually breaking down doors" of record stores, according to a report in Billboard. 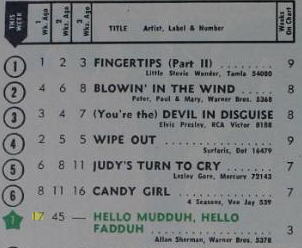 A month later, by the end of August, "Hello Muddah" was the #2 single in the country and Nut was the #1 album. The Chicago Mayoral Proclamation came at the request of Mark Cohen, author of Overweight Sensation: The Life and Comedy of Allan Sherman (Brandeis U. Press, May 14, 2013). Overweight Sensation is the first biography of the song parodist, and it has been featured on NPR, WNYC, Chicago Tribune, Los Angeles Times, and more. Eric Alterman, author and The Nation columnist, called Overweight Sensation a "remarkably well-researched, passionately written story of quite nearly tragic proportions." Prof. Stephen Whitfield at Brandeis University praised it as a "superb, absorbing account." 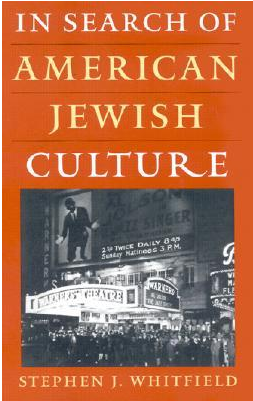 Prof. Victor L. Cahn at Skidmore College described the biography as an "entertaining, informative, and ultimately moving story." From the front page of Billboard, August 24, 1963. 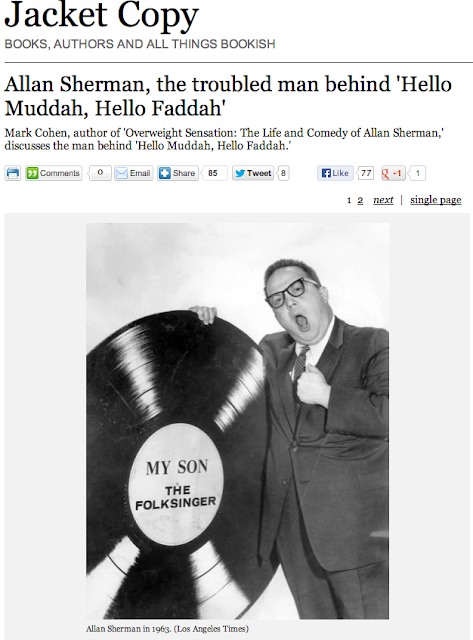 In this podcast, I talk with Aaron Lansky, founder of the National Yiddish Book Center, about our guy Allan Sherman. Click on image and enjoy. An Allan Sherman fan, and fan of Overweight Sensation, wrote today to report that "The person next to me on the plane was reading it, also." Is there any better proof of the book's existence than seeing someone read it on a plane? 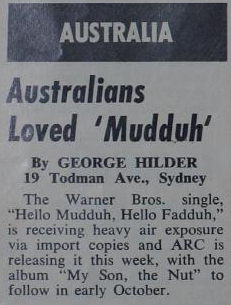 On August 17, 1963, Billboard spotted the international sensation "Hello Muddah" was beginning to cause. 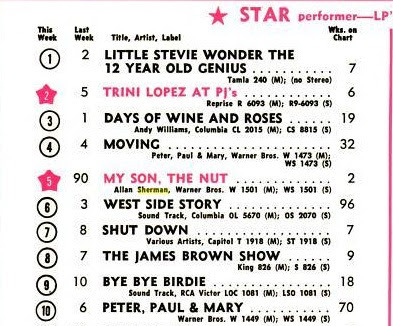 On August 17, 1963, Billboard marked My Son, The Nut's climb to #1 when it highlighted the album as a national breakout hit. Sherman's year of extraordinary fame that began in October 1962 was nearing its peak moment. A sign of Sherman's importance is his prominence in this Warner Bros. Records advertisement. My Son, The Nut is in the top slot. 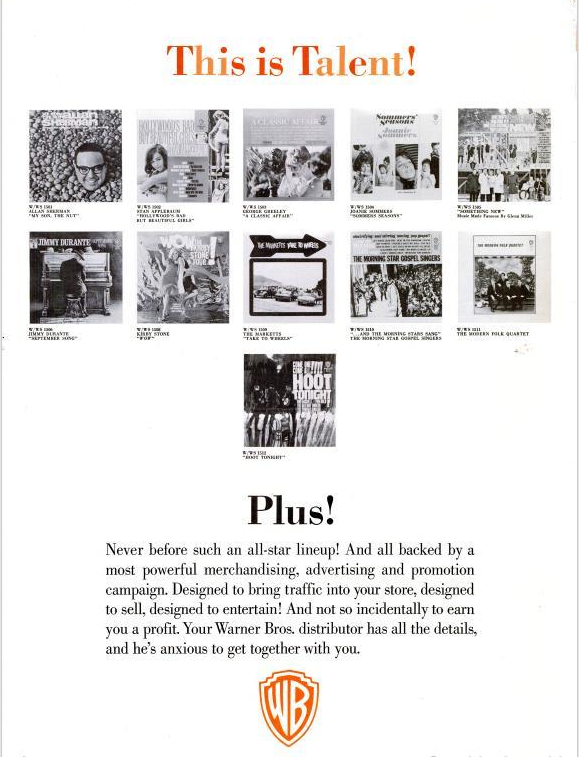 In the summer of 1963, Sherman was a big star at the top of his game. 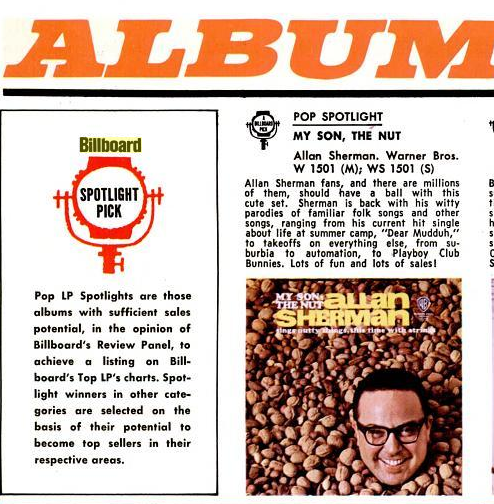 Fifty years ago this week, Allan Sherman's third album in 10 months - My Son, The Nut - hit the market and started climbing the charts. As the write-up notes, the album contains the hit single "Hello Muddah," mistakenly called "Dear Muddah." 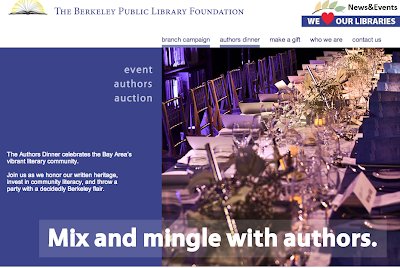 I've been invited to the Berkeley Public Library Authors Dinner, the idea being that an author hosts each table purchased by Friends of the Library. I'm humbled and honored. Very cool. February 8, 2014.